International conglomerates like Pepsi are in the middle in tariff fight between the U.S. and Canada — and now they have to find a balance between covering higher costs and scaring off customers with price hikes. Canadians should brace for higher prices on everything from soda to soup as manufacturers begin to feel the impact of the U.S.-Canada trade war and pass on the cost of aluminum and other tariffs to retailers. PepsiCo Beverages Canada recently advised retailers that it plans to raise its prices by about a penny per can, starting at the end of July. In a letter sent to retailers in late June, the beverage giant cited tariffs the Canadian government recently implemented on a range of products, including the aluminum that makes the cans that holds the company's drinks. Those tariffs were themselves in retaliation for levies the Trump administration put on Canadian metal products, specifically a 25 per cent tax on steel and a 10 per cent tax on aluminum. "We take costing actions and changes very seriously," Pepsi's letter reads. "Due to the business challenges the surtaxes pose, we have determined that we must pass through cost increases." Almost 90 per cent of the Pepsi products consumed in this country are made at one of the company's six Canadian manufacturing plants. But the supply chain criss-crosses the border multiple times, which is how tariffs come into play. 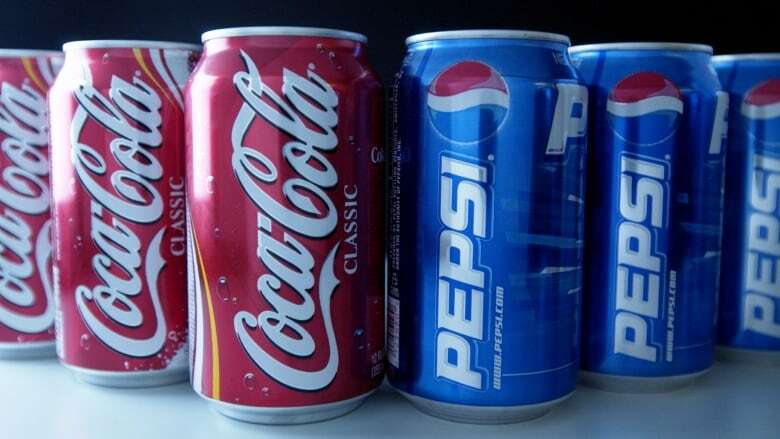 The letter said as of July 31 retailers who sell Pepsi products will pay one cent per can more for those products. Whether stores raise prices for their own customers is up to them. The company did not respond to multiple requests for comment for this story, but it's clear Pepsi isn't the only food company that's been forced to tackle the tariff question. In its earnings last week, Coca-Cola CEO James Quincey revealed that it, too, had recently hiked prices for canned beverages across North America. "Clearly, it's disruptive for us [and] it's disruptive for our customers," Quincey said on a call with analysts to discuss the company's financial results last week. "But the beverage industry is not the only industry that is facing pressure from changing imports and the need to [change] pricing," Quincey said. Food companies are feeling the pinch, too. Campbell Company of Canada, which has been dealing with some big changes including plant closures and a departing CEO, said it has been "acutely impacted" by ongoing trade issues. The company said the cost of freight, packaging and ingredients are increasing — and so are prices. The company wouldn't give details about its pending price hike, which is expected to go into effect in late August. Metal prices are a major cost factor for Pepsi, Coke, Campbell Soup and others, so higher prices for the finished products are something Canadians should brace themselves for. But if there's a silver lining for consumers, it's that canned goods are probably the type of food that retailers are going to be the least willing to jack prices on. "Demand just isn't there," says Sylvain Charlebois, a professor in food distribution and policy at Dalhousie University says of canned goods. That may not be true for all parts of the food chain but when it comes to canned goods at least "if you look at the grocery store prices have gone down." That's good news for consumers now, he says, because it means retailers will be less likely to try to raise prices on a product they're already having trouble selling. "A lot of these products are loss leaders, products sold at a loss to attract consumers into a store," he says. On paper, a 10 per cent increase in aluminum might translate to a hike of between two or three per cent once it filters down to the retail level. But grocery chains have more leeway with canned goods on pricing, because they aren't perishable like other items. "They can test the market," Charlebois says. "They may increase prices [but] if there are no takers they'll just take it back and wait a while until there's demand for a canned good at a higher price." On its most recent quarterly earnings, Loblaw Cos. Ltd. CEO Galen G. Weston said tariffs are one of many factors squeezing the company on the expenses side. "We see a very strong possibility of an accelerating retail price inflation in the market," Weston said. "We're committed to delivering value to our customers as often as possible with our pricing strategies, but there are limits." Another factor in all of this is the value of the Canadian loonie, which is impacting consumers just as much as it is hitting grocery chains who import much of their products from the U.S.